Since the birth of the Free Speech Movement half a century ago, this city has prided itself on its liberal values and policies, be they generous benefits for the needy or a look-the-other-way attitude toward marijuana use. Now, the city is bringing those policies together with a new amenity for the poor here: The marijuana will be free. Beginning next August, medical marijuana dispensaries in this city will be required to donate at least 2 percent of their cannabis to low-income residents. The City Council approved the requirement this summer – unanimously no less – with the hope of making the drug, which can sell for up to $400 an ounce at dispensaries, affordable for all residents. But the charity cannabis mandate, which city officials believe is the first such law, provoked a swift backlash from critics who mocked it as a tie-dyed fantasy in a city already famous for liberal experiments. Mr. Lovell said the free marijuana would sap patients' motivation to look for work – after all, it is not a drug known for encouraging anyone to get off the couch – and could easily be resold on the street for profit by people who are short on money. "I don't see anything progressive about that," Mr. Lovell said. Tom Bates, the mayor of Berkeley, said the city was simply trying to ensure equal access to a drug he emphasized was medicine, useful for treating cancer pain and other maladies. "There are some truly compassionate cases that need to have medical marijuana," Mr. Bates said. "But it's expensive. You hear stories about people dying from cancer who don't have the money." Mr. Bates, a former state legislator and football player at the University of California, Berkeley, has also championed home brewing and organic vegetables on school menus. As for medical marijuana, "it's a novel ideal to have it available to the poor," he said. "Berkeley is sort of known for doing new things." Nearly 20 years after California became the first state to legalize medical cannabis, Berkeley's new law highlights a paradox of marijuana as medicine: Whether it is sold illegally on the street or legally in a dispensary, access to the drug depends almost entirely on whether you can pay for it. Almost anyone with $40 to spare can find a doctor who will prescribe cannabis to treat insomnia or migraines or low appetite or something else (but especially insomnia). Yet, because marijuana remains illegal under federal law, insurance companies refuse to cover such treatments, which can run to hundreds of dollars per ounce for designer strains like All Star Sonoma Coma at local dispensaries. It is not as if marijuana, medical or otherwise, is tough to find here, amid the vegan restaurants in downtown Berkeley and the smoke shops on Telegraph Avenue. On a recent Wednesday afternoon, Joseph Skyler, an undergraduate at the university here, sat on the street with a group of homeless men, who were making trinkets and jewelry to sell to tourists. He was smoking marijuana that he said had been prescribed to him for insomnia. "I believe in living a certain kind of lifestyle that's very stress free," Mr. Skyler, 23, said. "I've noticed that just from smoking, everyone calms down." No one else sitting with him had a medical cannabis card, though that had hardly stopped them from smoking marijuana. Mr. Skyler said they should all have access to medical marijuana. "These people deserve it," he said. "A lot of these guys have the same problems I have." At least in the San Francisco Bay Area, where marijuana is more socially accepted than cigarettes in some circles, an informal network already exists to help low-income people obtain medical cannabis. Across the bay in San Francisco, David Theisen, 56, has relied on what he calls "compassion," a popular term for free medical cannabis, to deal with insomnia. After moving to the city several years ago, he quickly learned the compassion schedule at several dispensaries, which give away a few dried-out buds to the first comers once or twice a month. When one dispensary cut back, said Mr. Theisen, a former line cook who remains unemployed, he started going days without sleeping. "I can't afford to buy it, but my need isn't any less than anyone else's," he said. The compassion system has now been formalized in Berkeley, where city officials aim to provide low-income patients with a more reliable supply of medical cannabis. Only Berkeley residents are eligible for the free marijuana, and they must show proof of income (less than $32,000 a year for individuals). Dispensaries, which are prohibited by California law from turning a profit, will also have to hire security guards to patrol nearby, in order to deter crime (though, true to Berkeley's character, the guards will not be allowed to carry firearms). One of the city's largest dispensaries, Berkeley Patients Group, already gives away marijuana to patients who cannot pay. One of them is Arnie Passman, a poet and longtime Berkeley activist, who has been a recipient for about a decade; he could not remember exactly how long, nor was he entirely sure what condition his prescription was meant to treat. "It could be for my allergies, or my arthritis – you know what happens to us folks: We forget," Mr. Passman, 78, said. "I can give it a blanket 'I feel better.' It helps me get going in the morning." But Sean Luse, the dispensary's chief operating officer, worries that the city mandate could lead to resale on the street. Currently, about 100 people, not all of them Berkeley residents, receive free marijuana from Berkeley Patients Group, representing about 1 percent of the drug the facility dispenses. The new law will now compel the dispensary to give away about twice as much. "No one has really quantified the legitimate demand; they just set the 2 percent threshold out of thin air," Mr. Luse said. "Are we going to be forcing medicine on people just because it's the law? There could definitely be a financial incentive for folks to resell it." Mr. Bates, the mayor, acknowledged that resale was possible, but he waved away the question of whether there was enough demand. "There's a huge demand – we could make it 20 percent," he said. He said he was more concerned with trying to regulate the safety and quality of the cannabis, which is not tested or standardized by the state, and varies substantially from one dispensary to another. 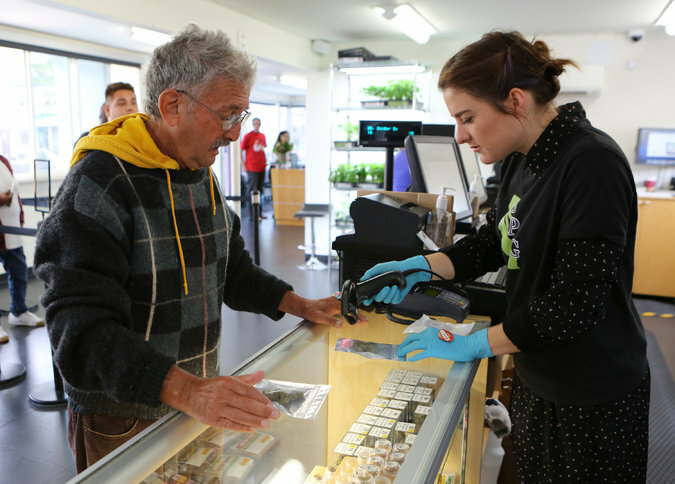 Unlike the low-grade varieties often handed out by San Francisco dispensaries, the free cannabis under the law in Berkeley must be of the same quality as the marijuana that customers pay for – ideally, grown organically, Mr. Bates said, without any pesticides. And despite the mocking from outside city limits, on the streets of Berkeley, no one voiced much objection to the new law. "If you believe marijuana is medicine, then helping low-income people purchase the medicine they need kind of makes sense to me," said Bill Green, 49, who works for a solar energy company. He added that there was "probably a lot of use of medical marijuana by people who don't really need it," but that he saw an easy fix to that problem: full legalization. If the city's mandate is another step toward legalization for recreational use, Mr. Bates said, then so much the better. "I think what we're seeing now is an evolution towards full legalization," he said. "It's coming. It may not be in the next few years, but it's coming."